Disclosure time: I’m neither a foodie, nor a food blogger. As I noted in an earlier post, I’m just a midwestern, multi-tasking soccer mom trying to cook more and write more. Just trying to do one of those things would be too easy. About the challenge: I tried the whole “write daily, write what you know” approach to creativity and inspiration. Didn’t work. I always found myself distracted by laundry or the treadmill, by exhaustion or a weeknight late-movie get-away with a girlfriend. I like my lady-friends and my movies. In fact, I need them. They go very well together. One exception to this would be an October 2012 screening of “Perks of Being a Wallflower.” What a miserable film. I saw it with two new-ish friends. It was our first date. I thought we’d progress slowly, the three of us. But after enduring 120 minutes of moony teenagers in their underpants and prom-wear dealing with depression, first-love, milk shakes and SAT prep, I feel bonded to these two women for life. We’re probably doing a three-day spa weekend in Nova Scotia for my birthday. Or at least I hope they are planning that for me. As a surprise. Someone should ask them. Rejecting preconceived notions of what my shopping list should look like. The chutney: Last Christmas, my husband bought me a stylish and practical menu-planner/calendar hybrid. It really was a thoughtful gift and well conceived concept. There was a strip of paper for every day of the week, and the last strip of paper was detachable. 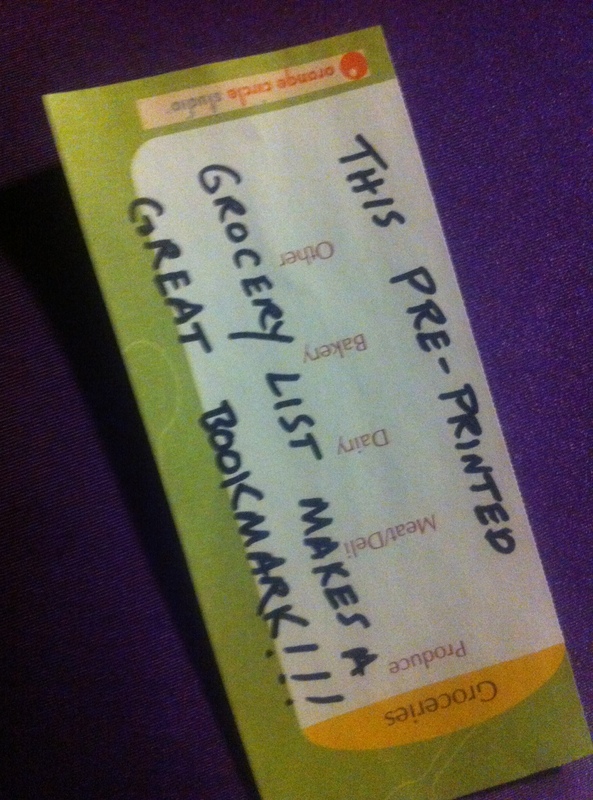 For making lists of groceries. There were even categories of groceries pre-printed – the same ones every week – on that wee little scrap of paper: produce, dairy, meats, frozen. But the more people expect me to do something, the more those menu-planner calendar designers think they know about me, the more I resist. I planned five menus that year, 2012, using the calendar. In an ode to potential that may yet be filled, however, I have kept the calendar. And so I keep this blog. About chutney challenged: All of this is my way of telling you that finding the right recipes, the right pace and a truly adventurous culinary spirit could take a while. I am very excited to write here about making and serving ragda pattice, just as I was about bhel puri. But there’s so much to do any given day that i find myself stretching one recipe into three blog posts. And here’s the thing about Indian cooking: it takes a lot of dishes. I’m still washing dishes from the ragda experiment two days later. I think about my aunts in Mumbai and their small kitchens where everything from sponges to teaspoons has its very own groove. No square inch in their kitchens goes unused. Their stovetops are not much bigger than your toaster oven. But over here in Milwaukee I am using every darn dish in my kitchen and realizing that even more than new spices, sharper knives and an extra three hours/day minimum, what I really need to master Mumbai street cuisine is an economy-sized dishwasher. 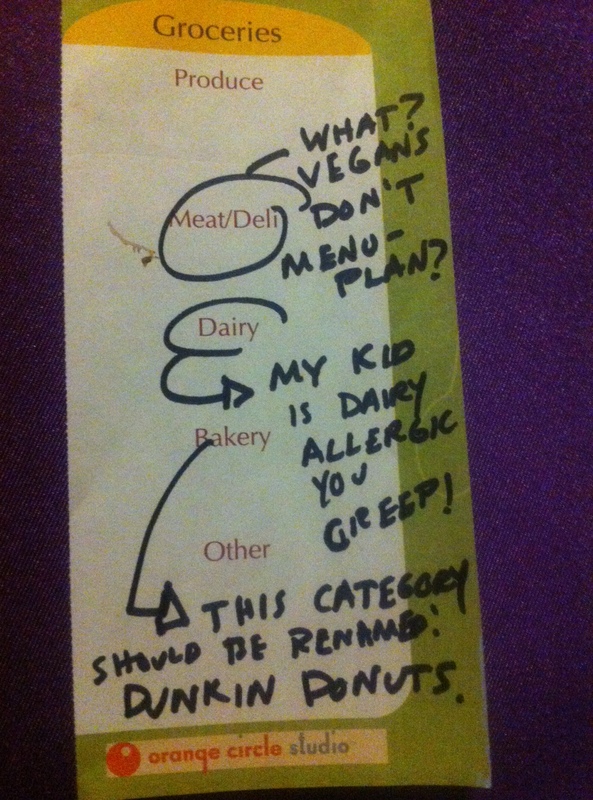 Warning: some may find the contents of pre-printed grocery list offensive. Next post we will drench ourselves in chutnies and chilies. The ragda pattice were a trial to make, but totally worth it.